Light as a feather and flying through the air, birds remind us of levity. Bring that ease into your nest with this alluring work of avian art by mixed-media artist Dolan Geiman. Geiman creates works of art that echo elements of American folk art in their tactile beauty. Here, Geiman has taken a digital reproduction of an original mixed media artwork to produce a fine art print. Prints signed individually by artist. Made in Chicago, Illinois. Just lovely! Looked at this piece several times before making the purchase. We have a new home in an area with a lot of birdies. My housewarming gift to myself! this is going to look so great when it is framed! After staring at this piece for a few weeks, I realized that I had to buy it. I tend to be pretty conservative with my money, so this, to me, was an investment. I couldn't have made a better decision! This artwork is just stunning and I find myself staring several times a day. 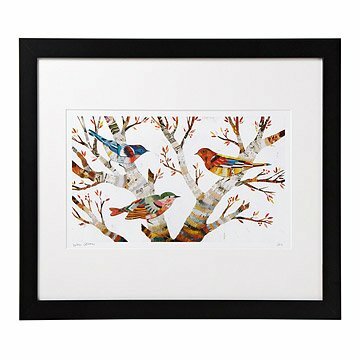 Folk art and sophistication blend in this print of mixed-media artist Dolan Geiman's stunningly original work.